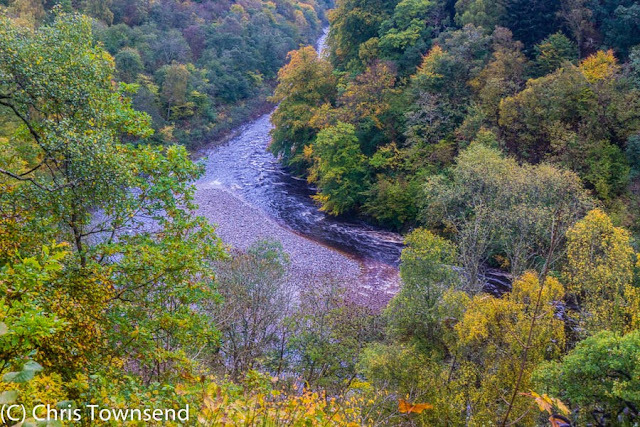 On my way home from the launch of Peter Wright’s book Nature’s Peace, described in my last post, I stopped at the Pass of Killiecrankie and took a walk amongst the splendid woods that line the deep gorge of the River Garry here. The day was grey and wet with low clouds and heavy showers. Everything glowed with dampness. Sometimes these are the best times to visit forests, especially in the autumn, as the colours stand out on the wet leaves. This year the autumn has been mild and in mid-October many trees are still green. The deep reds and yellows are mostly still to come but there have been enough changes for the woods to look magnificent, the solid green of high summer long gone. The paths were slick with mud and sodden leaves and drops of water fell from every branch or bush I brushed past. 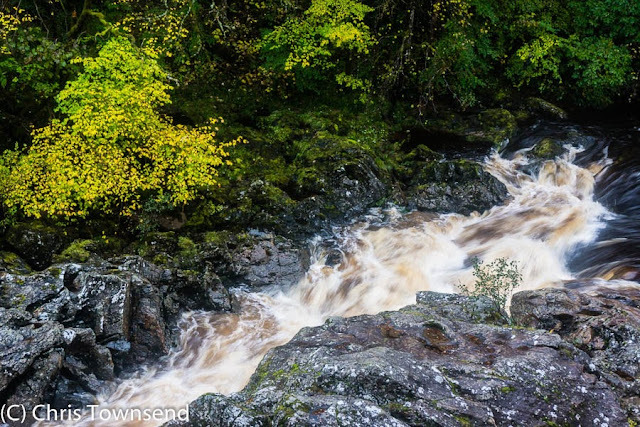 Down in the heart of the pass the River Garry was a swollen torrent, the water thick with debris. High above mist was drifting over the tops of the trees on the rim of the pass. The sky was darkening rapidly as dusk fell. Gone were the long evenings of summer. The air was thick with the smell of autumn. Killiecrankie comes from the Gaelic for Wood of the Aspen but there are many more trees here – massive oaks and beech, delicate rowans and birches and more. The Pass is owned by the National Trust for Scotland and there is a visitor centre and café by the car park at the entrance but both were closed on this visit. The Pass is famous for a battle that took place here in 1689 when the Jacobites defeated government forces. One soldier is said to have escaped by leaping the River Garry at a narrow rocky section now known as Soldier’s Leap. The history is interesting but it’s the forest and river than make this a wonderful place. 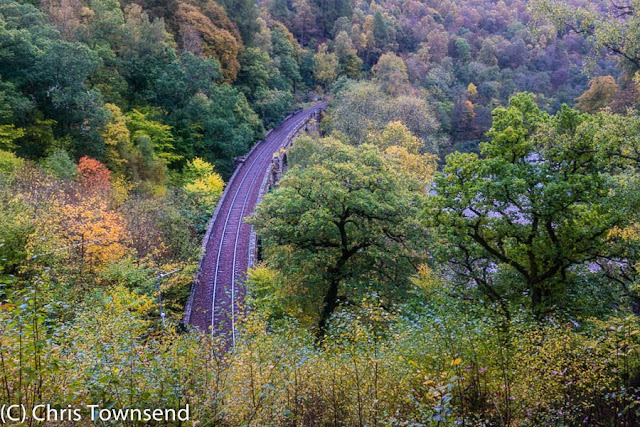 Soon the autumn colours should be really spectacular. I hope to return before the final leaves fall. Yes Chris, it's almost as if autumn is on 'hold' this year. We need a few frosty nights!